My kids have been back in school for over a month, and homework and activities have kicked into high gear. Leaves are drifting to the ground and blanketing the grass. Tomorrow we’ll turn the calendar to October. Summer is behind us (although the 80-90 degree temps have made it easier for my mind to remain there). In the swirl of summer memories, two keep rising to the top. As each situation unfolded, I thought, “I could blog about this.” I got busy with other things, but they’ve continued calling for my attention (even though neither is directly related to anything mentioned above). I think their appeal is due to the fact that each involved two things: kindness and strangers. There’s a reason there are so many quotes about this combo. There’s something magical about it. It was mid-June (technically not even summer yet). My girls were headed out of town on a Tuesday, a few days after the end of their school year. They were flying to California to stay with their uncle and aunt, and were planning to visit additional relatives. In the midst of end-of-year teacher-gift-buying-and-making, I had picked up gifts for relatives as small tokens of our appreciation. My closet looked like Christmas in June. My family would have said, “No need,” but I really wanted to. These people were planning to take care of my girls for two whole weeks, laundry and all. They were also giving me way more kid-free time than I’d had in 15 years. I love my kids and they’re great kids, but let’s be real, parenting is tiring. The school year ended. Monday afternoon arrived. All the gifts were ready! Except. As I searched the gift pile, I realized that I had bought the turtle earrings for my mom (and the flower earrings for my daughter’s friend’s birthday), but I hadn’t bought the dolphin earrings for my sister-in-law, after all. They were still sitting on a rack at the gift shop at Lewis Ginter Botanical Garden. One-and-a-half hours away in Richmond. Oh no! I drove to an outdoor mall in Charlottesville in search of something dolphin or cat or unicorn related. I saw a cute-looking store that I hadn’t noticed before. It was already 5 pm, so I dashed in. It was filled with cute knick-knacks and accessories. Perfect! I started to scan the shelves and racks. There I was wearing my typical shorts, t-shirt, no make-up, and graying hair. I felt tired and frazzled, and probably looked it, too. I told her about my sister-in-law’s preferred animals and mythical creatures. She reached for a pair of cat socks; too young. A unicorn stuffed toy; too big. She showed me a few more items, but nothing quite worked. “I just really want to help you,” she said. I could tell that she did. And that she was disappointed with our luck so far. “Thanks for all of your help. I’m sure we’ll find something,” I said, trying to reassure her. Several times during our interactions, she said she was tired and apologized for stumbling over her words. Each time I told her, in one way or another, to please not worry. “I do that, too, when I’m tired,” I said (and it’s true). I wanted her to give herself a break. She was trying so hard to help me find a gift, and to come across as the perfect professional. I understood this trying-hard-at-life thing. Don’t so many of us? I spotted a mug. Not practical for luggage, but good enough. “I found something!” I said. Then she started to cry. She said that she was a single mom with a four-year-old, that she was divorced from her daughter’s dad, that it was the best decision, that she loves her daughter more than anything…but that life was overwhelming. “I went to my car during lunch and cried,” she said. She came around to the other side of the sales desk. She bent down and I reached up, and we hugged. Two strangers in the middle of a store. “You made my day,” she said. She called back, “You, too!” She was smiling. She looked radiant. She didn’t look tired. The evening sunlight was streaming into the store and enveloping her red hair in a warm glow that made her look…well, angelic. I walked to my car marveling that by simply being a decent human being, I’d made someone’s day. After my girls had landed safely in California and I could breathe again, I called the store and left a message for the manager saying what amazing service I had received. Because really, that young woman had made my day. 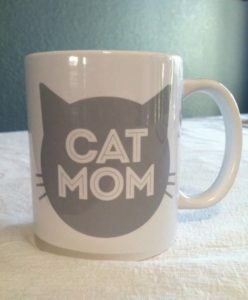 And my sister-in-law loved her mug! 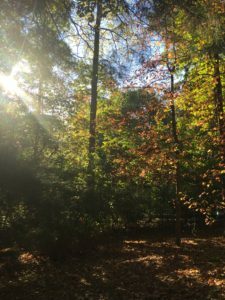 While our girls were away, my husband Rob and I visited a few places that we hadn’t managed to get to in our 16 years in Charlottesville. One place was White Oak Lavendar Farm located about 50 minutes from our house, on the other side of a mountain which is part of the Shenandoah National Park. We made it there and basked in all things lavender. 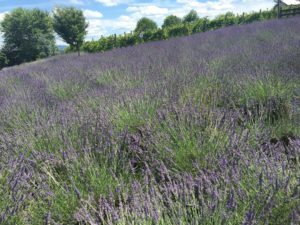 I didn’t get around to trying the lavender wine, but I still felt intoxicated by the scent of lavender that permeated the place — from the fields and the shop products and even the tea. Guess what else filled the air on this picture perfect day? The sounds of live harp music. Life slowed down in this heavenly place. It was more than worth the drive. Afterward Rob and I enjoyed an equally relaxing late lunch/early dinner nearby. Then we decided to head back over the mountain to Charlottesville. “I think so,” said Rob. I pulled over onto the narrow strip of grass near the guardrail and popped the trunk. 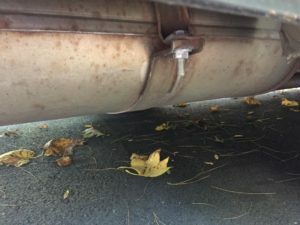 We climbed out of the car and checked out the muffler hanging by one intact but rusted bolt. The other bolt had bitten the dust, lost somewhere on the road behind us. Ah, my trusty old Toyota Corolla. It had passed the annual inspection a couple months before. Yes, we tend to keep our cars, Rob and I. My last car was towed away for parts right before we moved from Brooklyn. I still remember standing in my doorway waving good-bye to it like an old friend. Rob’s now seven-year-old car replaced his nineteen-year-old car. Yet this was the first time, ever, that I’d been stranded by the side of a road. As a driver or a passenger. How lucky I’d been! It could’ve been worse. It could’ve been raining. It could’ve been dark. We could’ve started ascending the mountain. There were some stores, although they lay miles ahead of us. Anyway, it was Sunday at 5 pm. What would be open then in this rural area? And what was it about me and the 5 pm hour? We looked in the trunk. No tools. My fault. I’d taken out the emergency crate to make room for our girls’ luggage and hadn’t returned it. There was some random stuff in there: reusable shopping bags, plastic forks, coupons, a clipboard, a lint roller. The most promising thing was some plastic twine. Rob wondered if it would burn from the heat of the muffler, but it was the best we had, so we were going for it! Rob is a handy guy, much more so than I. He lay down on the grass with his head under the car. My attention felt divided between the cars whizzing by at 60 mph a few feet from his head, and the trail of ants crawling all over him. I decided it was more important to keep my attention on the traffic, just in case I needed to scream at him to jump over the guardrail to safety. We’d deal with the ants later. The cars on the two lane road kept zooming past us. Who knows where they were coming from or where they were headed? But I was keenly aware that we were in the middle of what was likely Trump territory. This is not to say that people who voted for Trump would hurt us or not help us, but as two Asian Americans, we were not in our comfort zone. We would have felt more at ease had we broken down in, say, Brooklyn or Charlottesville. Several minutes later, a big pick-up truck slowed down and parked behind us. My eyes zeroed in on the specialized license plate: Don’t Tread On Me. My eyes jumped to the driver behind the tinted window. He opened his door and stepped out – all 6’4’’ of him. A white guy wearing jeans and a t-shirt, he looked to be in his mid-20’s. He struck me as a nice guy; I caught a good vibe. “Hey!” I said and smiled. Rob was looking up from the grass and watching the scene unfold. The guy went back to his truck and soon brought us a strand of bailing wire. “This is perfect. Thanks a lot,” said Rob who was now standing. “That was so kind of you to stop,” I said. The guy said, “Whenever I see someone broken down on this road, I pull over. People drive really fast here and they don’t always know what they’re doing.” He smiled. “That’s so kind of you,” I said again. “Congratulations!” Rob and I said. We thanked him again for saving the day. We exchanged names and handshakes. And the guy drove off. Rob got to work with the bailing wire while I continued to keep an eye on the traffic. A few minutes later, we heard a loud honk. We looked over to the other side of the grassy median and saw the guy passing us. We waved. “Really nice guy. He really went out of his way,” said Rob. “Yeah,” I said, “just showed up, helped out, and took off.” Kind of like a superhero. When we got back home, I put that emergency crate back in my trunk. The next day Rob left town for a work trip. And I took my car to the shop. I asked for two new bolts: one to replace the missing bolt, and one to replace the other rusty bolt that would fall out in a matter of time. 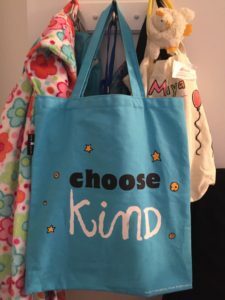 “Choose Kind” is a theme in the middle grade novel Wonder by R.J. Palacio. This is Miya’s favorite book; she’s read it several times. It’s about so many things, but at the heart of it is kindness. During these divisive times, I find myself holding tighter to stories of kindness – online, in the newspaper, in books, in life. These stories don’t erase the stories of horror, but they remind us that there is often kindness around the corner or down the street. It’s ours to give and, if we’re lucky, to receive.